Flowers Bloom on People: teamLab, 2017, Digitized Nature, Endless, Sound: Hideaki Takahashi. Photo courtesy teamLab © 2016 teamLab, courtesy Pace Gallery. 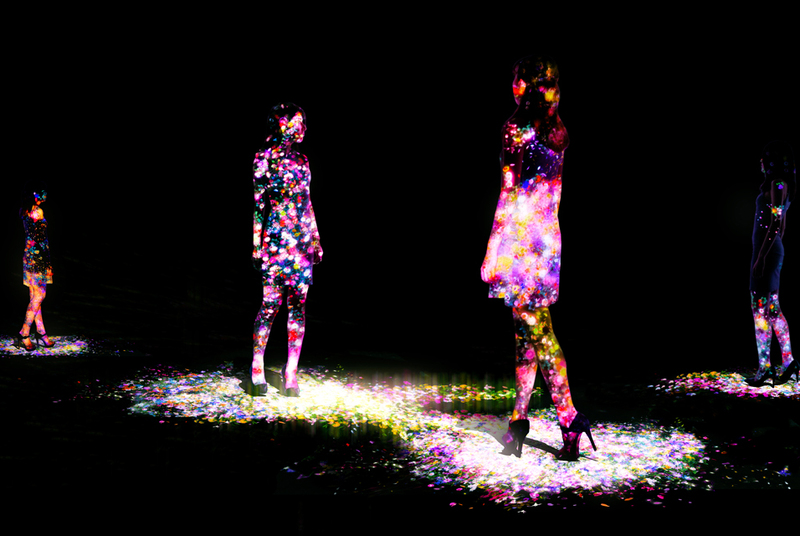 LONDON.- Pace London announces Transcending Boundaries, an exhibition of works by teamLab featuring three rooms of immersive installations, two of which have never been seen before. The exhibition will be on view from 25 January to 11 March 2017 at 6 Burlington Gardens. The largest room in the exhibition will include six works and feature Universe of Water Particles, Transcending Boundaries (2017), a virtual waterfall that extends beyond the gallery wall onto the floor, flowing through the exhibition space and around the feet of the viewer. It engages with the concept of Ultra Subjective Space, central to teamLabs practice, referencing the non-perspectival depiction of space in premodern Japanese art and situating the viewer directly within the realm of the artwork. Encompassing the second room, Dark Waves (2016) is a simulation of the movement of waves based on the behaviour of hundreds of thousands of water particles. The waves are created in a three dimensional virtual space, expressing water as a living entity that immerses the viewer and suggests an intrinsic connection with nature. In the last room, the darkened space is transformed by the presence of the viewer, which activates Flowers Bloom on People (2017). With the body as a canvas for the projections, flowers are in a process of continuous changegrowing, decaying and scattering in direct response to the viewers movements. teamLab (f. 2001, Tokyo, by Toshiyuki Inoko) is an interdisciplinary group of ultratechnologists whose collaborative practice seeks to navigate the confluence of art, technology, design and the natural world. Artists, programmers, engineers, CG animators, mathematicians, architects, web and print graphic designers and editors form teamLab. teamLab operates from a distinctly Japanese sense of spatial recognition, investigating human behaviour in the information era and proposing innovative models for societal development. The collective aims to go beyond the boundaries of art, science, technology and creativity through collaborative initiatives. teamLab has been the subject of numerous exhibitions at venues worldwide, including the National Taiwan Museum of Fine Arts, Taichung (2012); teamLab: Living Digital Space and Future Parks, Menlo Park, California, USA; National Museum of Emerging Science and Innovation, Tokyo (2014); Borusan Contemporary, Istanbul (2016); teamLab World: Dance! Art Museum, Learn & Play! Future Park Seoul, South Korea; and Dayton Art Institute, Ohio (2016), Light Festival in Tadasu no Mori at Shimogamo Shrine, Kyoto, Japan; among others. Their exhibition DMM.PLANETS Art by teamLab was featured by global media including CNN and Aljazeera. Their work has been included in group exhibitions internationally including recent presentations at the Museum of Contemporary Art, Tokyo (2014); Japan Society, New York (2014); ArtScience Museum, Singapore (2015); Asian Art Museum of San Francisco (2015); Mori Art Museum, Tokyo (2016); and TenShin Memorial Museum of Art, Ibaraki (2016). In 2015, a projection of their work Universe of Water Particles was exhibited on the façade of the Grand Palais, Paris, France. Permanent displays are on view at the Living Computer Museum, Seattle; National Museum of Singapore, among other venues. teamLabs work is included in the collections of the Art Gallery of New South Wales, Sydney; Art Gallery of South Australia, Adelaide; Asian Art Museum of San Francisco; Asia Society Museum, New York; and Borusan Contemporary Art Collection, Istanbul.